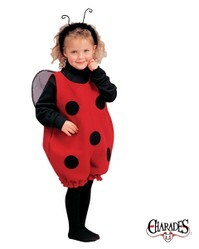 There's something really cute about lady bugs that make them an ideal toddler costume. There are a few different styles of lady bug costumes for toddlers and they all have one thing in common - they make you want to go 'awwww' as they are too cute! I always thought that lady bugs wore polka dots the best, but looking at toddler lady bug costumes there's a new contender for the title of the best looking polka dot wearer! I hope you enjoy the selection of ladybird costumes for toddlers that I have found, they really are 'as cute as a bug!' It's really hard to choose just one I must admit, and I should point out that you don't have to be a toddler to wear a ladybug costume - you can deck the whole family out in these cool, cute, polka dot inspired ladybugs! 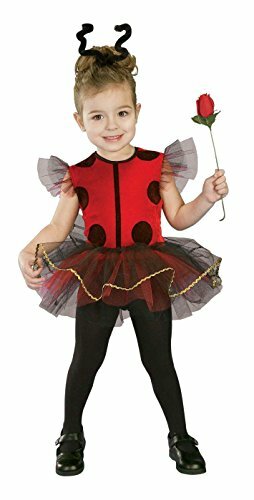 There's something special about toddler ballerina style costumes and this is not just a lady bug costume, but a ballerina style one which is really cute. The costume includes a black leotard along with the really cute layered red tutu with black piping. I think if it had black polka dots on the tutu it would be even better, but the cute factor is still on high. What makes the black leotard stand out from the basic one that you can get anywhere is that it has a red feather trimming on the sleeves and the neckline. The costume also comes with red wings with a black trim and the all important black polka dots that are worn like fairy wings. There are also red feather pom poms to put on her shoes along with an adorable black headband with red antennae leading up to red feather pom poms. Your toddler will absolutely love this costume and you'll look back on the photos in years to come with a nostalgic smile on your face at how gorgeous your little girl was. Note - the pictured black tights and shoes are not included. Here's another ballerina style lady bug costume which is just too adorable for words. As you can see the dress is red with black polka dots, just like a lady bug. The tutu is made of black and red material and has matching material around the sleeves of the dress as well. The tutu is also lined with gold to add a little extra sparkle to the outfit. Also included in this costume is the cute black antennae which is a lovely touch. Now for what's not included - the black tights as well as the shoes pictured are not included in this costume. I think if you're looking at getting a lady bug costume for your toddler whether for Halloween or just for them to play dress up in then you'll need to also 'invest' in a pair of black tights - footed or footless would suit. Personally I would buy footless tights a little on the long side because although toddlers often shoot up they can often still wear the same waist size tights which means they can continue to get a lot of wear out of their tights. how lucky must you be if you have a ladybug holding your hand? Now if we're talking about a cute costume for a toddler then this romper style Lady Bug costume fits the bill beautifully. It also looks incredibly comfy which is always a bonus when it comes to costumes. I must admit that when I first saw the costume I got a little clucky! 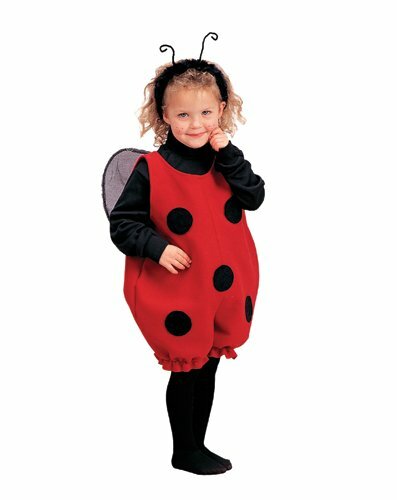 This comfortable red rompter costume with the all important black polka dots of a ladybug comes with detachable black wings and a matching black headband with antennae attached. The black long sleeved skivvy and black tights aren't part of the costume, but are a great idea to be worn under this costume as it will not only look good, but also keep your cute little ladybug snug! This ladybug costume says absolutely adorable, doesn't it? 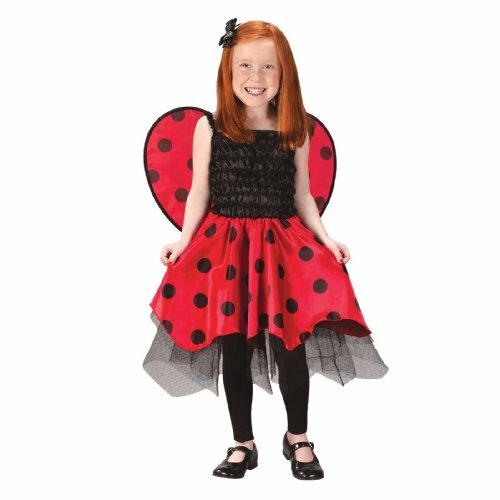 The costume includes a black and red polka dot dress with matching attached wings. The tights and shoes pictured aren't included, but to be honest I don't think the outfit even needs them. The black ruched top of the dress is a style that suits a lot of toddler girls and I know that my own daughter would've loved the ragged looking hemline of the dress when she was younger. I especially like the black material at the bottom of the dress as it just gives the dress another added texture to it's look which is, quite frankly stunning. I think this costume would be great if your toddler wants to feel like a 'big girl', especially if she has older siblings as it's an outfit that would make her feel very grown up while also looking incredible cute! Everyone loves to dress up for Halloween from the youngest baby to great grandparents so here's some great fancy dress ideas for everyone in the family. Ladybug Costumes for Toddlers - Please Pin! How adorable! Ladybugs sure are special! Oh my how cute. I love these and sure any little girl would as well, hmmm wonder if they come in my size. If you're looking for a cute costume for your toddler then these food inspired costumes are exactly what you need from chocolates to fruit these costumes are good enough to eat!